First of all: i really like publisher so far. Overall I find the align and distribute functionality confusing. First, I am not a fan of aligning to first or last selected. 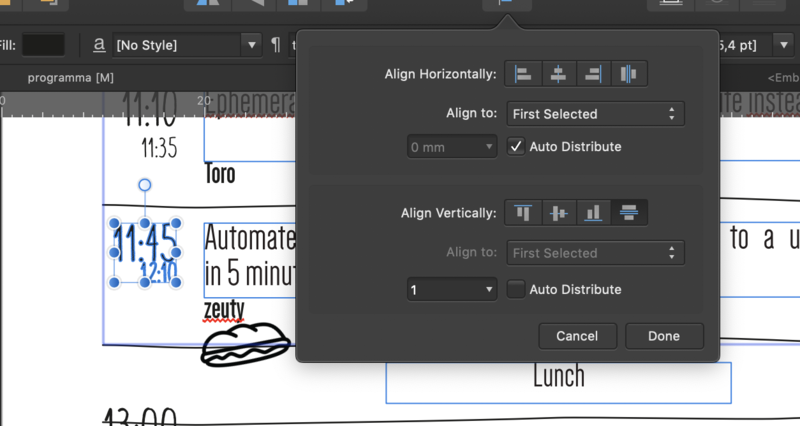 The illustrator way (first select the items and then click on the reference item) is much more versatile and requires less clicks in a lot of situations. 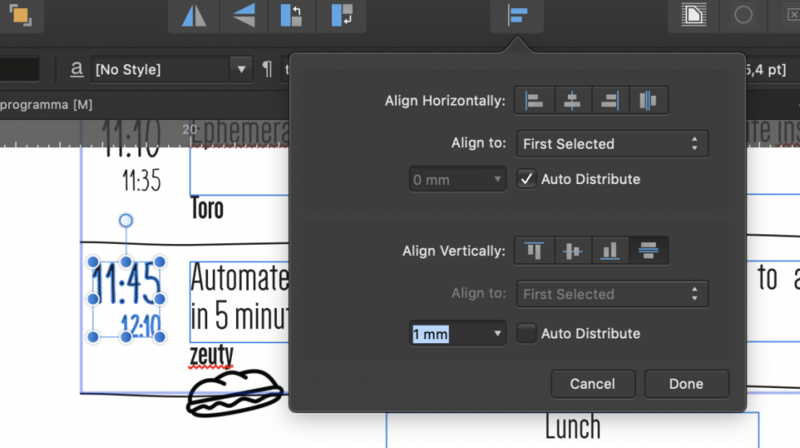 Update about last bullet point: it works if you add mm before pressing the align button. It seems that affinity does not understand the 1 without mm and then uses 0 as distance. I would classify this as a bug, if you have your document set for mm then it should use mm. Maybe post it there. Just checking and it works fine on Mac Sierra OS 10.12.6, are you on Windows? Don't need specific mm or pt and spaces are need either. Thx for checking. I work on 10.14 Mojave. Then it may be Mojave + a Dutch Keyboard (I am guessing you are Dutch, apologies if I am wrong) problem, or just a Mojave problem. I work on 10.14 Mojave. Tip: In the future, whenever possible, wait about a year before upgrading Mac OSs. They no longer 'just work' . On my system (Windows 10, Publisher 1.7.0.157 Beta) my alignment dialogue differs from yours slightly in the position of Auto distribute and the input box. Secondly I can type any number I want into the distance input and mm is automatically appended before the actual alignment operation is carried out. 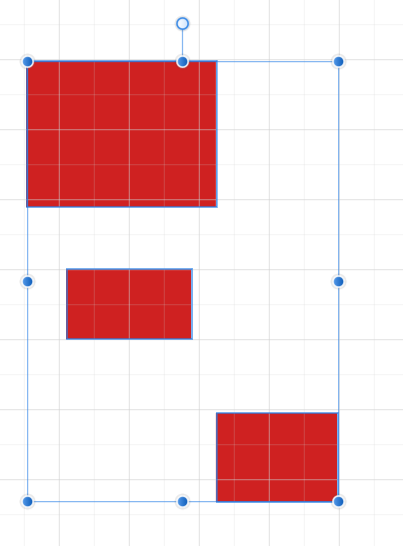 then a size selection slider opens allowing you to drag to resize. As you adjust the slider you will see the adjustment being applied live to your selection. I am from and live in Belgium but I have a Dutch keyboard indeed. How is this related? Probably not, I just have heard of Keyboard codes causing problems that programmers could never foresee. Your other problem is happening with me so I think that there is an OS problem from Sierra on up. Enlarging on my previous post about live updating alignment here are 3 screenshots showing how three text boxes are moved as the slider bar is being adjusted. Above How the text boxes were originally positioned. On the first point, if you shift-click an item twice, it should remove then re-add it to the selection, making it the last selected. That should give the same flexibility as having a reference item, without needing the complication of a reference item (which we don't need for anything else). However, when I tested this I found it often didn't work. I'll log it to be looked at. Shift-click? I would have expected ctrl-click to provide that functionality. On Mac, ctrl-click brings up a menu. Thanks, Dave. I missed that the OP is on Mac (but there is also at least one Windows user in this discussion ). And it's hard for a user of one OS to be aware of some of these subtle differences in the other OS. Perhaps I've misunderstood you, or perhaps there's another Windows vs Mac difference, but if I do any clicking "on an item" that is part of a selection, that item becomes the only object selected. For what you've described to work, it seems that I have to (double ctrl-)click on the item's layer in the Layer panel, not on the item. Or is that the issue that you mentioned you logged to be looked at? I'm not near a Windows machine to check, but I believe this uses the same modifier key as Mac, namely Shift. Holding down Shift while you click on an object in the main view will toggle it in and out of the selection. This part works on Mac. In the Layers panel the UI is different. Shift-click there selects a range, and Cmd-click on Mac, and probably Ctrl-click on Windows, toggles individual objects. Thanks, Dave. That did not work for me on Windows, in Publisher .162. I have not checked the other Affinity applications. That would drive me nuts, I rarely shift click to toggle the selection in and out of a selection but regularly deselect one or more of a dozen selected items selected by the drag around a group method. I've now tried it on my home Windows desktop, in .162, and it did work for me. Using the Move tool and Rectangle shapes - Shift-click does something different in text, and Shift-drag does something different again. If it still doesn't work for you, maybe report it in the bugs forum. If one uses shift-click on either the top or bottom rectangle it is clear that it works, and it is clear what's happening because the outer selection box changes. and which was apparently too subtle for me when I did the test. Sorry. No problem. Thanks for confirming it works. I'll hook into this thread, as I don't want to open another one. I too quite like the option to set a reference object to which the selection is then aligned – deselecting and selecting again seems a bit counterintuitive to me, though a useful workaround. When I use those, they seem to always default to "align to spread" with one selected object and "selection bounds" with multiple objects selected. Is there a way to control what alignment mode the buttons work in? I'd like to reduce having to go into the overlay-menu of the single alignment button. I don't think there's any way to control that. By the way, those buttons on the Toolbar seem to function the same way as their counterparts that appear on the Context Menubar when you have multiple objects selected. So unless you want them for the 1-object case you may be wasting Toolbar space by putting them there. You could also try the alignment handles. 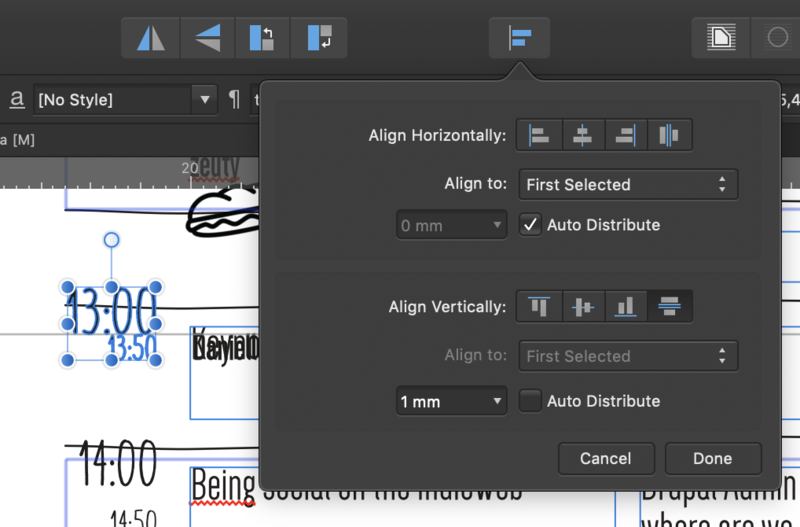 With the move tool selected, on the context toolbar is an icon with two arrows pointing toward a line in the center, which toggles the alignment handles on and off. Try turning them on. With a bunch of objects selected you should see an assortment of arrows pointing to the bounding box. 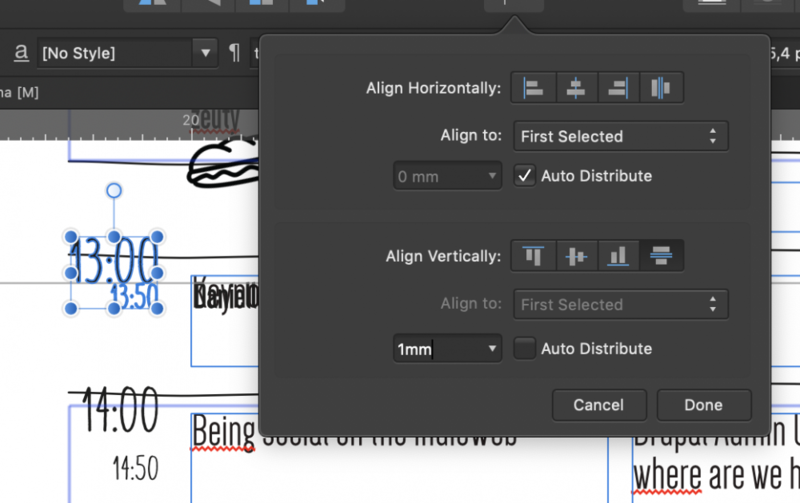 Grab the one pointing upward for example to align the top edges of the objects; drag that arrow and snap it to the position you want to align to, and the top edges of the selected objects will snap to the "line" you drag out with the arrow. while the buttons on the context menubar do function the same, the alignment handles change things quite a bit. That's actually a pretty elegant solution in my opinion, thanks for pointing that out to me.